"Linear phase equalization, without the latency." 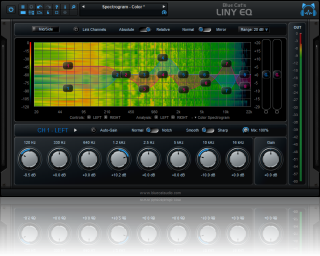 Blue Cat's Liny EQ is an 8 bands linear phase equalizer with very low latency and comprehensive visual feedback: thanks to its highly optimized linear phase kernel, it processes the signal without phase distortion, with an unusually short latency (less than 3 milliseconds). Its wide range of gain (+-40dB) and multiple filter shapes make it very flexible for a graphic EQ, letting you create unique EQ curves. The dual channels version offers independent settings for the left/right or mid/side channels, with flexible linking capabilities for an optimal workflow. 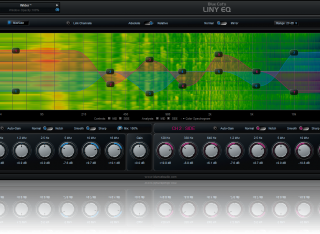 The highly customizable user interface includes a first class spectrum analyzer and spectrogram viewer. It lets you choose the best layout and display options to adapt the plug-in to your own workflow. Thanks to its ability to update the EQ curve continuously using MIDI or automation and its additionnal "Mix" control, dynamic equalization tasks can be performed easily when used together with any of our control generation plug-ins. Typical applications: Low latency linear phase equalization, mastering, mixing, spectral correction, stereo widening or narrowing. very short latency (less than 3 ms: 128 samples at 44,1 kHz), with minimal pre-ringing artefacts. customizable range (+/- 40 dB). Real time spectrum analyzer display. High resolution color and greyscale spectrogram display. High resolution color peak meter. Single and dual channel versions. Left/right or mid/side processing for spectral stereo widening or narrowing. Highly customizable user interface: display what you need, the way you need. Customizable user interface with transparency management . Any DirectX / VST / RTAS / AAX compatible host software (32 or 64 bit). Mac OS 10.5 or newer. The plug-in is regularly bypassed for a few seconds. Custom skins can be selected directly from the main menu. Presets can now be selected using MIDI Program change and bank select messages (optional). Last loaded preset can now be saved directly from the presets menu without having to select the file. Audio Suite support for offline processing in Pro Tools (AAX). Copy/paste the plug-in's current state from the presets menu using the system clipboard. Reduced the plug-in's memory usage. Windows VST Installer now remembers where the plug-in was initially installed to simplify upgrades. (Mac) plug-in version number is now available when using "Get Info" in the Finder. (Mac) Improved display of Audio Unit parameters in most host applications. Fixed window frame not showing with Cubase 7.5 (32-bit) on Mac. (Mac) About window does not show up first in the corner of the screen anymore. (Win) Alt-Click on a control now resets the value to default in Pro Tools, as expected. Fixed version number reported to host application for VST and Audio Unit versions. 64-bit AAX support for Pro Tools 11. New instant spectrum curves display. New color or greyscale overlayed spectrogram view. New output peak levels meters. New "mix" parameter for instant dry/wet control or side chain dynamic equalization. 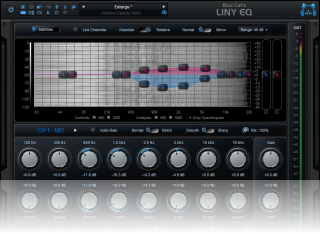 New interpolation mode for up to four different EQ shapes. 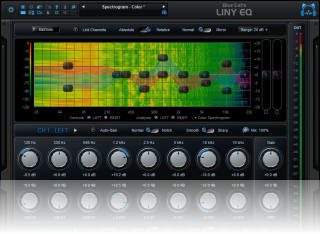 Now includes both single and dual channels versions and superseds the three plug-ins previously included in the Blue Cat's Liny EQ Pack bundle. Load/save presets from the plug-in's user interface. Automation range and response curve can now be customized for each parameter (in and out). Automation and MIDI settings (channel, MIDI learn etc.) are now accessible from the main user interface. AAX plug-in format is now also supported on Windows (Pro Tools 10.2 required). Different EQ shapes can now be selected for each channel. New presets to get started faster. The windows installer now automatically detects the most appropriate VST install path. License is now shared between plug-ins types (register only once for all formats). Improved value display in fine edit window. Improved parameters display on control surfaces. Improved parameters precision (now stored as 64-bit). More compact presets format (uses less space and loads faster). Smaller binaries on Mac (dropped PowerPC support). (RTAS) Fixed parameters control with EUCON control surfaces in Pro Tools. Fixed user interface issues in Final Cut Pro X. Fixed user interface display issues in Wavelab on Mac. Fixed keyboard stealing issue in Digital Performer 7 on Mac. Fixed copy/paste keyboard shortcut issues in the registration panel on Mac. Note: this new version can be installed side by side with the previous version for backward compatibility reasons. Installing this new version won't break your previous projects. Fixed keyboard focus stealing issue in Pro Tools and several other host applications. RTAS plugin format support for Pro Tools (Mac and Windows). 64-bit applications support for Windows DX and VST under Windows x64. Space bar does not trigger plug-in buttons anymore (avoids conflict with transport control in most applications). Demo version now displays a nag screen only once per session, and only when opening the user interface of the plug-in. 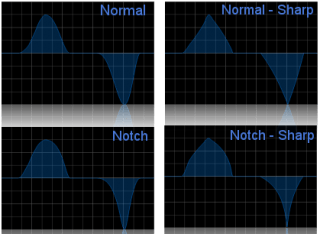 Fixed issue with EQ curve type that was sometimes not properly recalled. Mac: fixed user interface crashes in some hosts under Snow Leopard. Mac: fixed keyboard/mouse focus issues in some hosts. Mac: fixed multiple screens issue. Mac-AU: fixed settings lost issue when doing offline rendering in some applications. Mac VST update: fixed incompatibility issues with Cubase 5 on Mac. 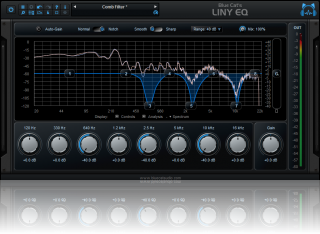 The plugin now offers two types of EQ curves. EQ range is now customizable. Preset import/export in a host independent format. Window opacity control for plugin transparency. This version is installed as a new plugin because of the new parameters. You can keep the previous version and this one side by side. Advanced MIDI control with customizable parameters curve response and MIDI learn. Now supports Blue Cat's Skinnning language 1.2.4 with several skins per session. Parameters can be fine tuned when the shift key is down, which offers a .1 dB gain resolution. CPU efficiency improvement: no processing occurs when input is silent. Settings window now loads faster. (Bug fix): in some plug-in adapters (such as FxPansion's VST to RTAS adapter) the GUI did not display properly when first loaded. (Bug fix): when reinstalling the software in another directory, the "skin not found" message was displayed. Warning: because it now supports MIDI events, the DirectX plug-in may appear in the "Synth" or "DXi" category instead of "effects" in some hosts (such as Cakewalk Sonar). If it does not appear in you host, you might want to use our DXi Manager to de-activate MIDI features. Warning: this new version breaks the presets compatibility. New skinnable user interface, with several skins included. Blue Cat's Skinning Language 1.1 support, for an easy user interface customization. User manual available from the user interface. (Bug fix): no more constant -3dB offset on global gain. (Bug fix): the VST version now reports the latency to the host.